My Sites is the first screen you will encounter after logging in to Crafter Studio. This screen lists all of the websites you have been granted permission to. From this screen you can navigate to any site’s preview or dashboard. Crafter Studio administrators can also create and delete sites from this screen. My Account is where you go to change your personal Crafter Studio settings like language or to change your password. Each site has a Site Dashboard. To view a site’s dashboard, click on the Crafter CMS logo at the top left of the screen, or click on Dashboard at the top of the Sidebar. This screen is an overview of the workflow for that given site. The site dashboard has different widgets depending on your role. The Icon guide is simply a legend to help authors and content managers with the iconography on the system. While it can be very complex to sum up the state and nature of content in a glance, Crafter Studio attempts to achieve a high level visual summary for each object icons. You will see these icons throughout the application whenever an object is presented to the user. The icon always shows the Current state of the object. The Icon guide breaks down icons in to their elements. You have two basic elements which can be combined to form a specific icon: the item type and the worfkflow indicator. Item Types Item types are high level archetypes of content objects within the system. These types and the iconography associated with them provide a basic classification of the type of object at a glance. Page: A page is exactly what you would expect, it’s a URI addressable object that represents a web page or resource. : A component is an object that is generally not URI addressable on the website. Examples are objects like Banners, Touts, Sidebar content etc. 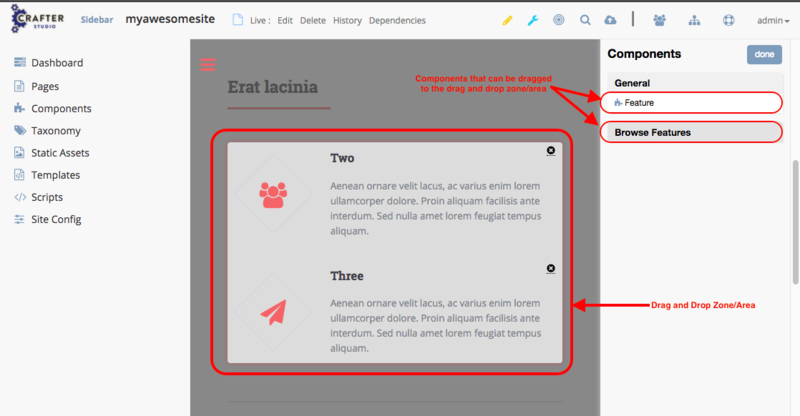 Components are usually re-usable assets that can be assigned and shared across many pages. : A taxonomy is an object the same as a component used for classifying items. 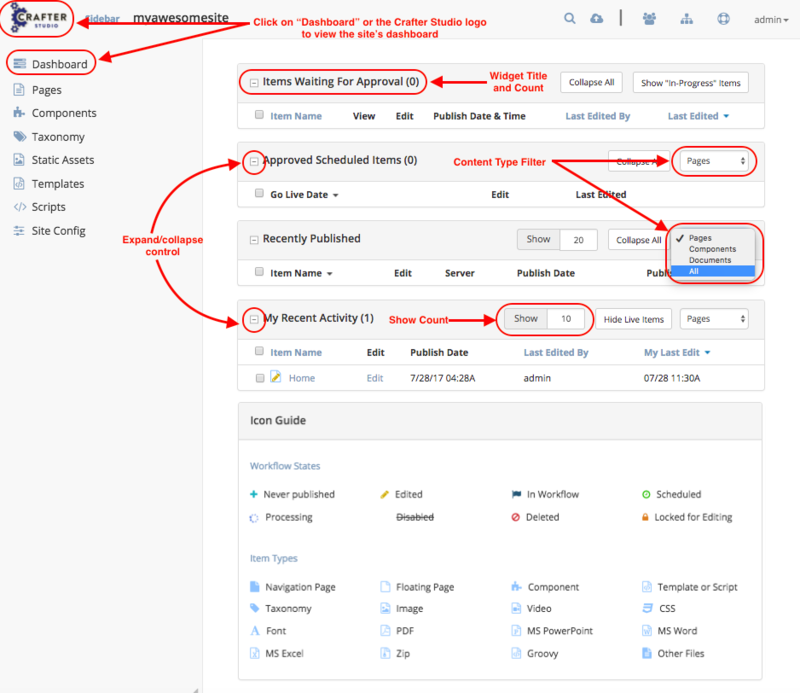 Workflow Indicators Workflow indicators help authors and content managers understand at a glance what is going on with the content at a high level. Is it Live? Is it work in progress? Is it currently checked out? In some sort of approval process? : You will find a * asterisk at the end of a content object’s name if the content has never been pushed live. This helps authors quickly identify which objects that are in progress are already live and which ones are entirely new. : You will find that some objects have a strike-through on their name, this means that the object is not deleted but it should not be displayed on the site. It’s essentially a logical delete. Imagine a scenario where you need to take an object down immediately because of an inaccuracy while you make corrections. Disable is perfect for this and several other scenarios. : Edited means that the item has been edited since it was made live. Items move to edited as soon as they are created or when they are edited. : A locked item is currently in the process of being edited by another author. : Item has a launch schedule associated with it. Every site has a preview. 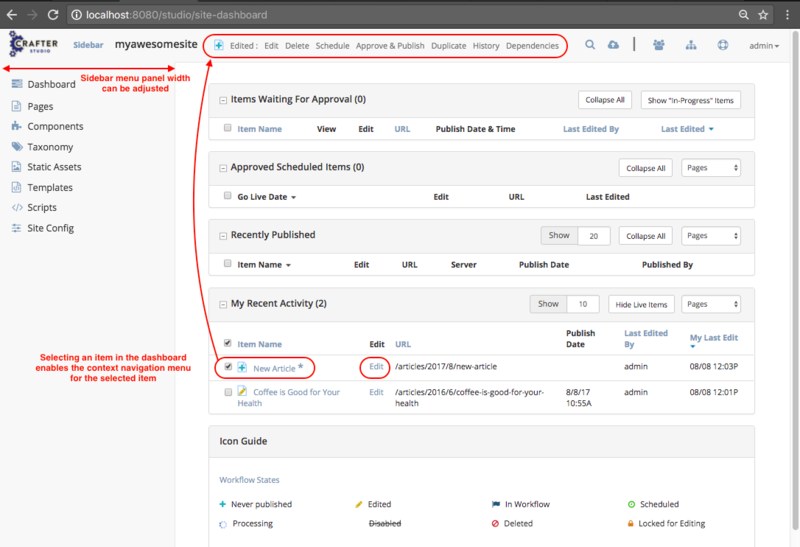 This allows users to see, edit and test the site in a safe authoring sandbox prior to publishing changes. 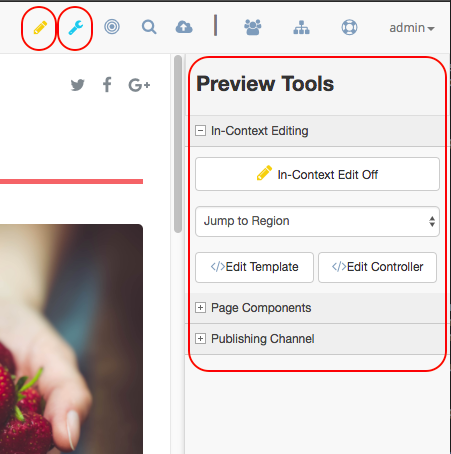 Preview is a fully functional site but in a safe-to-edit environment. When in preview mode your context navigation will show additional controls beside the authoring search. The pencil provides a shortcut to turn on/off in-context editing. The wrench turns on/off the preview tools palette. 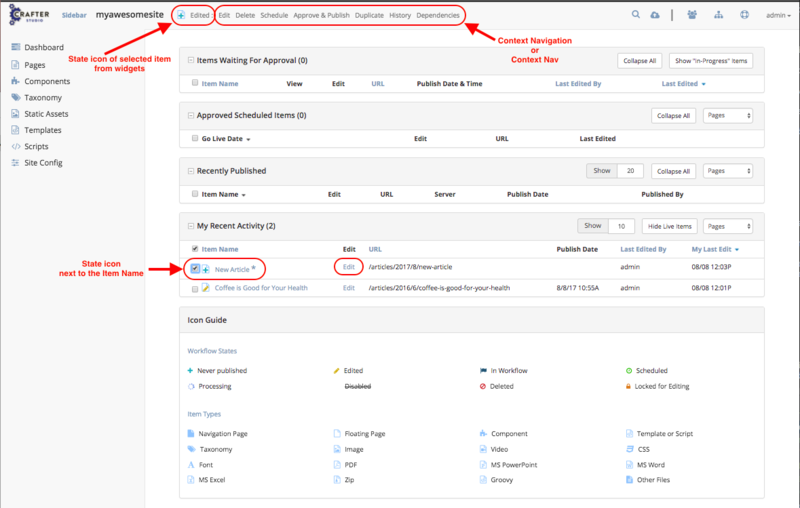 The bulls eye provides a shortcut to targeting which allows the user to view and set targeting attributes for the site. When in-context editing is turned on, pencils will show up around regions of the page that have been wired for in-context edit. 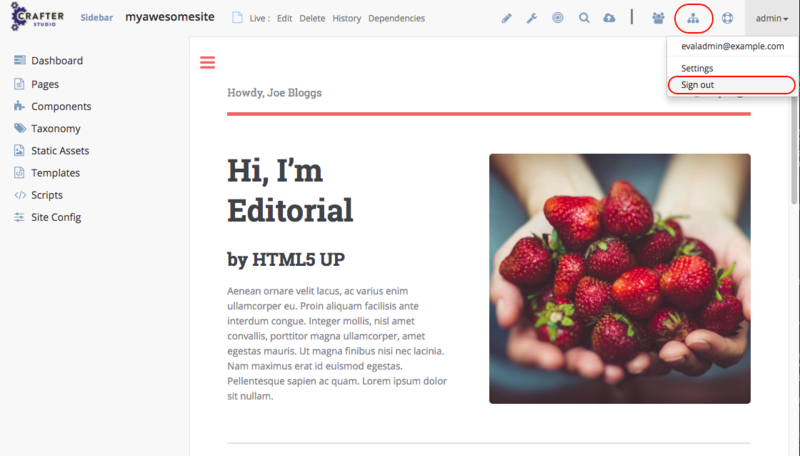 The template editor provides users who have the proper permission with an ability to edit the Freemarker templates that are used to construct the page. Users who do not have write access may open the editor but have no ability to save edits. A simple syntax highlighting editor is provided. 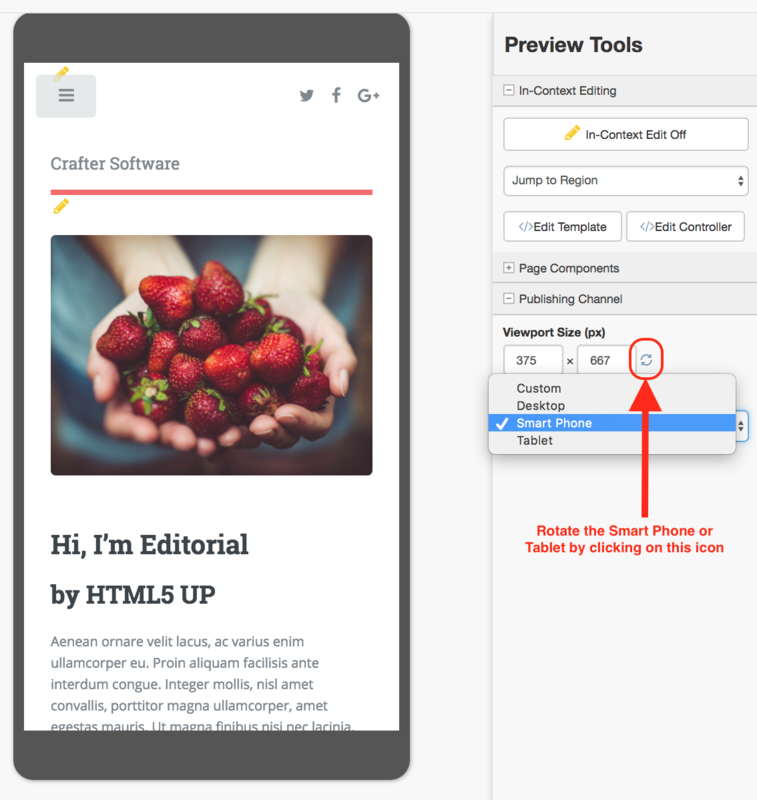 The Page Components (drag and drop panel) puts the page in component construction mode. Regions on the page that are wired to accept components (“drop zones”) are highlighted. The user may drag a component from one region to another. The user may create new components by dragging components from the panel out and on to the screen. 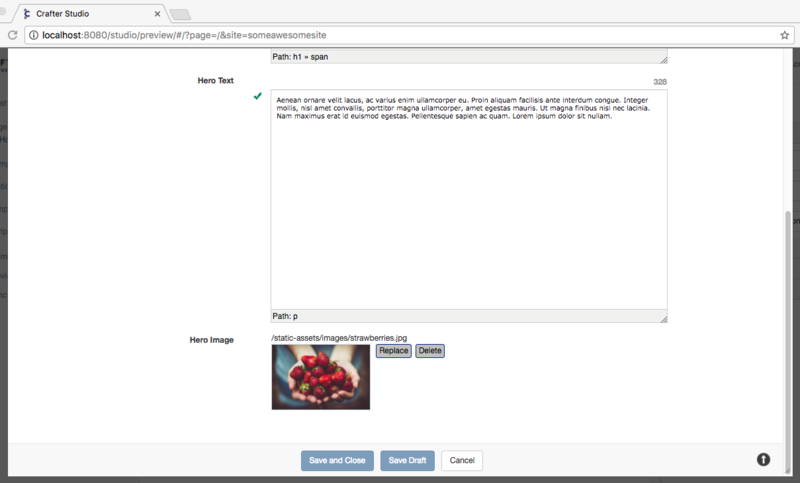 A dialog is presented to the user when a new component is dropped on the screen so that the author can configure the component. Crafter Studio administrators can configure what components are available in this panel. 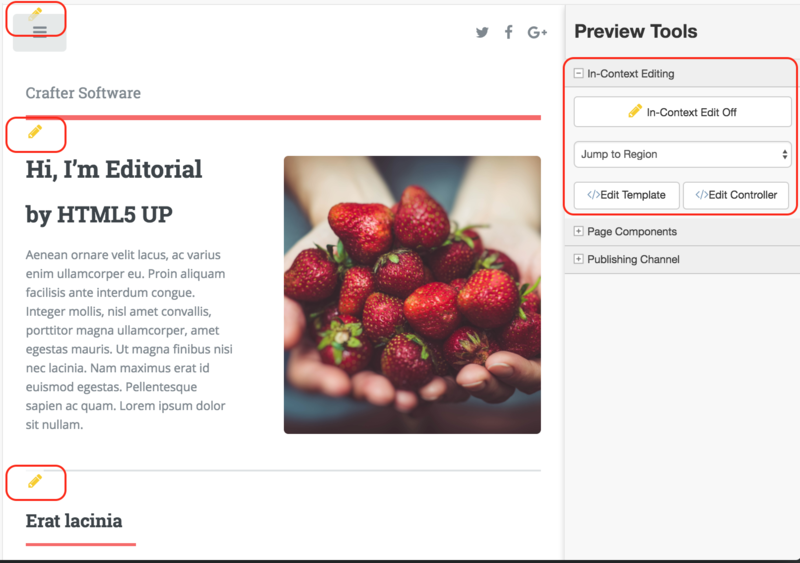 The Publishing Channel preview allows an author to review the current page in the context of all channels supported by the website. The Navigation Bar is a fixed element at the top of the page and cannot be scrolled off the page. The navigation bar provide contextual workflow and other options relative to the page you are looking at, content you have selected or tool you are using. Branded Logo Button: Takes the user back to the Dashboard. Sidebar: Opens a menu that allows navigation to all pages, components and documents in the system. Contextual Navigation Links: An area reserved for dynamic links that will change based off of the current page view. 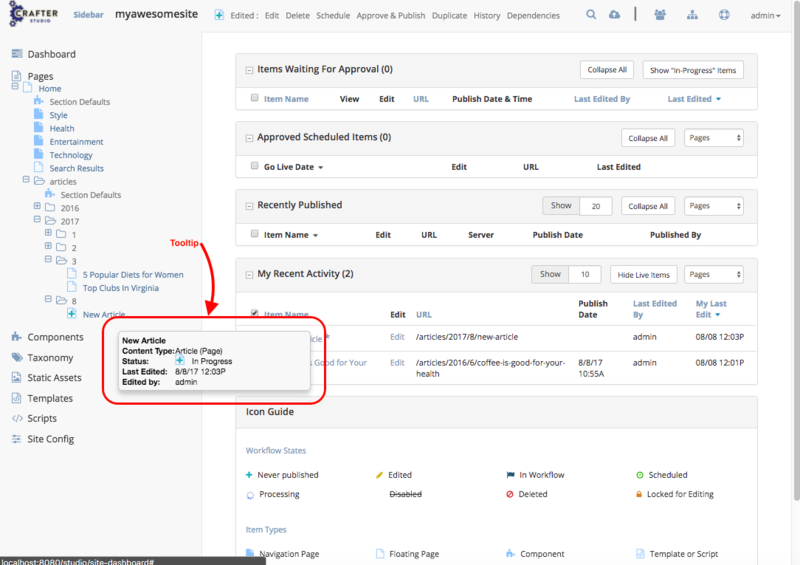 Publish Status: Allows the user to view the site’s publish status. Users: Allows the user (depending on permissions granted to the user) to view/edit the users. Help: Provides the user a shortcut to Crafter CMS documentation and the about screen, listing the Crafter Studio version, etc. 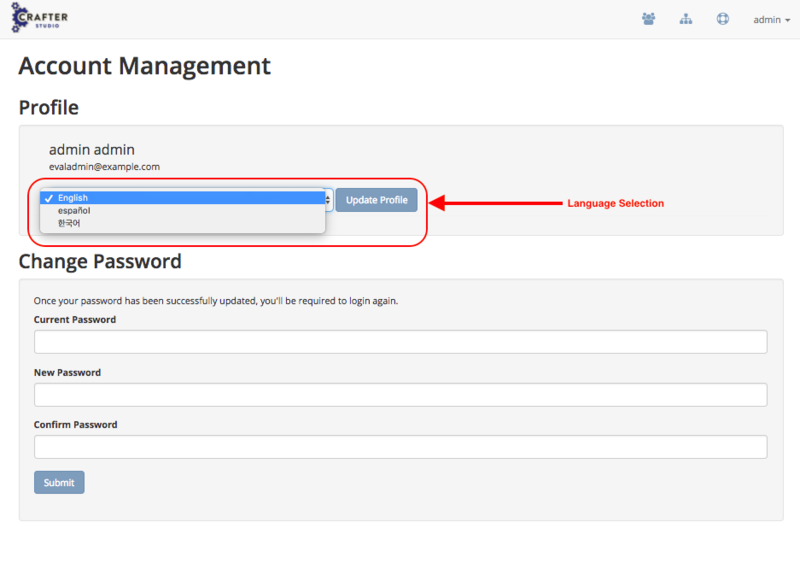 Username: Allows a user to log out of the system or manage settings. The Sidebar menu/panel allows for browsing all site content in the system. This includes Pages, Components and Documents. The “View” menu will allow selections of separate site properties. The menu width can be resized freely by the user. Users can have multiple tree paths open at the same time. If closed, the menu should retain it’s last state when re-opened. The top level blocks “Pages, Components, Documents” can be hidden from users based on their privilege settings. Clicking the main folders will toggle them open or closed. 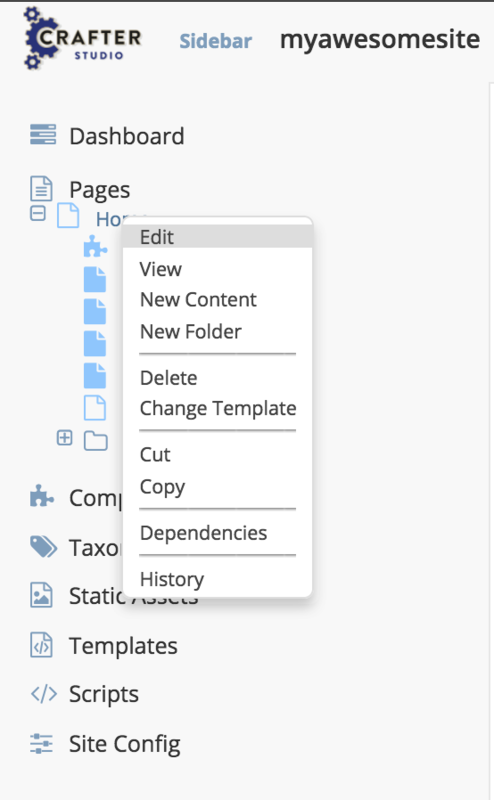 Root folders allow a user to drill in to a hierarchy of content. If the item is previewable it will also be clickable. Clicking on an item will take the author to a preview of the item. 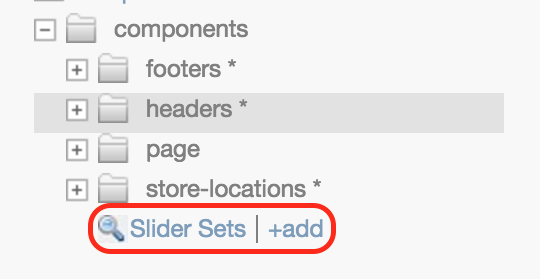 Also, tooltips featuring extended information will be available when hovering over any item in the Sidebar Menu or on the dashboard. Right-clicking on an item opens a contextual right click menu for that item. Occasionally you have so many pages or components in your information architecture that it is not practical to list them or you simply want to provide your authors with a quick way to get to a specific search. For these use cases Crafter Studio’s site dropdown IA folders support the configuration of dedicated searches. That configuration can be made by an administrator on the Crafter Studio Admin Console.